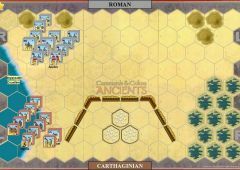 Carthaginian Army: Free Setup—Setup First & Move Second. 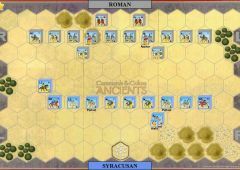 However the Romans get one Banner if they have a unit occupying a Carthaginian Camp hex—to a maximum of one Banner total scored in this way—if their unit is driven out of the camp hex or otherwise moves out they lose the banner—unless they have another unit occupying a different camp hex at the same time. 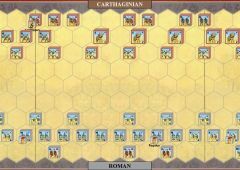 A Leader attached (stacked with) a friendly unit may cancel one sword hit on the unit in lieu of canceling a retreat hit. 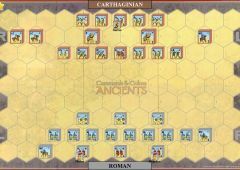 A unit involved in close combat with the support of a Leader may only count one helmet hit amongst those rolled to inflict a hit on an opposing unit, however if Appius is supporting the unit up to two helmet hits may be counted. 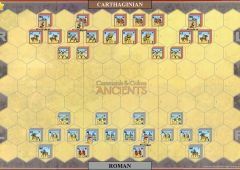 Special card Command Rules: The Carthaginian Player starts with a 2-card hand—he draws an extra card at the end of his 2nd & 4th Player-turns bringing his hand size to first 3 cards and then to 4 cards for the remainder of the scenario. 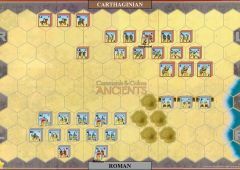 A maximum of six foot units can be ordered by play of a single Line Command Card in the scenario. 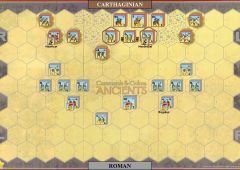 Units in the Carthaginian Camp hexes gain no advantage or dis-advantage in combat. Camp hexes DO block line of sight for Missile fire however. 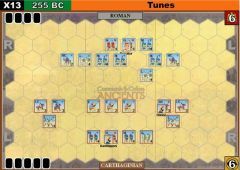 Balearic Slingers: The Carthaginian Slinger unit hits on ‘swords’ when missile firing at enemy light troops, or when battling back only if attacked in close-combat. 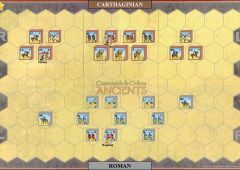 African Horse: The Carthaginian Light Cavalry unit retreats only two hexes per Flag result taken or inflicted on it.